Looks great with any dorm room decor! Having fruit in college is a must, especially if you love fruit. It's great for a quick snack and is an essential part of breakfast, lunch or dinner. Plus it's quite delicious. The problem? The problem is that you're in a small college dorm room and not at home, so storing fruit can be hard in college. Your apples can fall off of a table and turn to mush when bruised and your bananas can easily become bruised and mushy...just from sitting on a flat surface, by the way. And if you don't happen to notice that an apple fell from your dorm desk or the top of your dorm mini-fridge and it slid under your dorm bed or dorm dresser, well...you might find it by smell in a few weeks. And of course you don't want to store fruit in your college closet on your dorm floor! The solution to all these problems is simple - a dorm Fruit Bowl. Our Fruit Bowl is both functional and it will add to your dorm room decor. 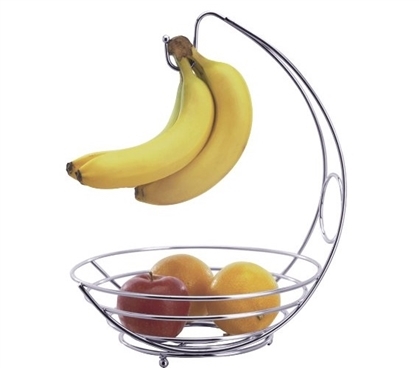 It has a sleek chrome wire style that will look great with your dorm room decorations while holding your fruit. The feet of this dorm essentials product are ball shaped to prevent scratching so you don't ruin the surface you put this dorm Fruit Bowl on - especially if it's a college provided dorm item that they could fine you for damaging. The bottom part of this dorm necessity is a bowl to hold your apples, oranges, and more. Coming off of the bowl is a hook to hold delicate fruits like bananas and grapes to prevent them from bruising. Don't waste money by throwing out bruised fruits - keep them fresh in college supplies like our Fruit Bowl!